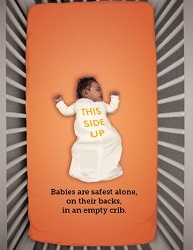 The Warren County Health District is committed to reducing sleep-related infant deaths by providing the Cribs for Kids program. Through a grant from the Ohio Department of Health, WCHD offers the Cribs for Kids® program that provides pack-n-play portable cribs at no cost to eligible families in order to provide a safe sleep space for their infant (under one year of age). Safe sleep education and follow up visits are also provided. Call 513-695-2475 to see if you are eligible for the program. The program services both Warren and Clermont counties.